Counter tables are similar to sideboards and buffets. With these kinds of tables, the words servers, sideboards and buffets are often used interchangeably. Although the furniture has slight variations in style, on the whole, the appearance is quite similar. Counter tables can be used in versatile ways in the modern home. The pieces that we have in our stock are very elegant looking and decorative. Candlesticks are a type of decorative accessory that can add a magical glow to your home. Placed individually or in groups, on the mantel or the dining table or anywhere else in the house, these will look classic and add an elegant touch to any decor. Candlesticks from the past are all the more appealing with the sense of drama that they can instil into a decor. Groups or a pair of classic candlesticks can give your space a timeless look. 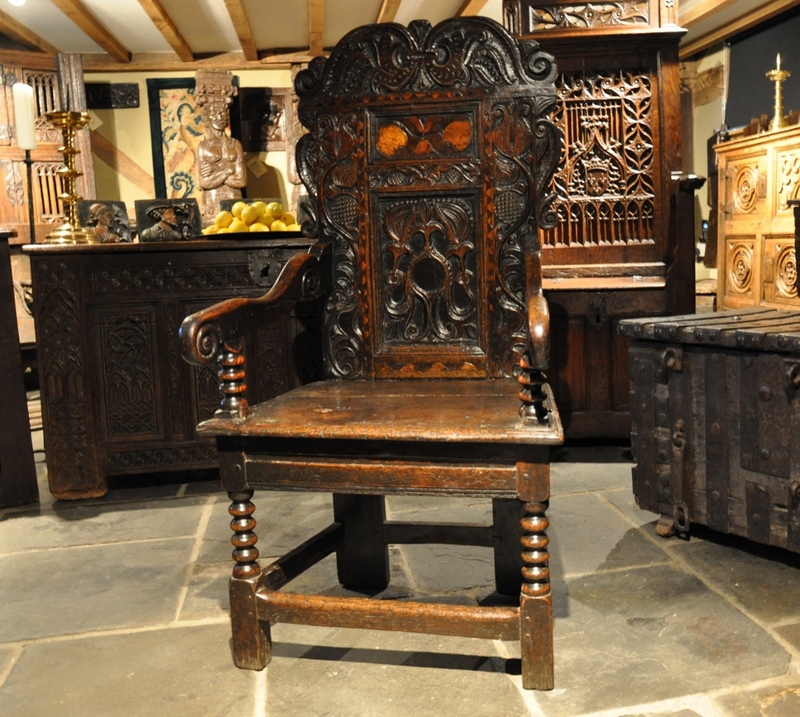 Period Oak Antiques is home to a collection of antique oak armchairs, all of the finest examples and some very rare. The armchairs in our stock are genuinely majestic and will look stunning in any room you choose. If you are looking for a chair with some artistic flair and brilliant style, you must have a look at our collection. Our oak armchairs in dark colours are all loaded with charm and style and will make a great focal point. At Period Oak Antiques we have an excellent variety of antique oak cupboards. 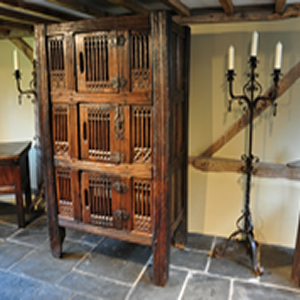 Our collection includes some of the rarest examples of antique cupboards that are still in very good condition. Antique cupboards are versatile pieces of furniture and can be used around contemporary houses in versatile ways. We have a great mix of 15th, 16th and 17th century antique oak cupboards in different shapes and sizes to suit all kinds of design themes. These belong to the different style periods such as English, Gothic and Tudor. 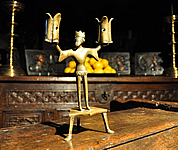 Period Oak Antiques is home to some of the finest quality early antique metalware, antique brass pricket sticks, 16th century candlesticks, 17th Century candlesticks and more. All amongst our fine stock of antique furniture belonging to many different periods and of different origins. 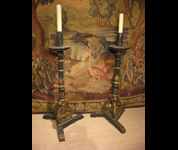 If you are looking for some classic examples of the 17th Century candlesticks, we have quite a few in our collection. Candlestands can be used to create very dramatic effect on the look and feel of your space. Did you know that gothic candelabras make very unique and at the same time very dramatic objets d’art in the modern home? The candelabras of the 1800’s in brass or silver were the star of the evening dinner table and provided both illumination and decoration for meal times. The candelabra was a very important part of the household along with candlesticks, right until the end of the 18th century when light fixtures came into being. Antiques Sculptures make an interesting decorative element. These add a sense of drama to the decor and also manage to add depth and warmth to any room in the home. Amongst antique sculptures are human figurines, animal figurines, corbels and a lot more. 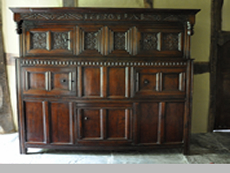 Are you looking for antique oak chests or coffers? 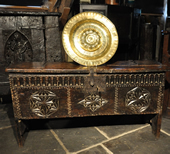 At Period Oak Antiques we have a variety of antique oak chests and coffers from different places and periods in a variety of different shapes, sizes and designs. Our selected collection often includes medieval chests, carved oak chests and army trunks belonging to the 15th century onwards. Side tables make a very functional addition to the home. And when these are from the world of antiques, these are all the more interesting and often do a lot of good to the interior with their characteristic charm. Side tables can bring some function and great style to your living space with their not so imposing presence. The history of English Antique Furniture has a lot in store for you in terms of versatility in designs. Some of the noted eras of furniture included the English Renaissance period, Baroque and Rococo Styles, Neoclassical, Victorian Era of machine made furniture, Art and Crafts furniture etc. All the styles had furniture options that were very unique in terms of the design elements and craftsmanship. 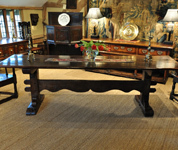 English antique furniture styles provide a good versatility in terms of designs. If you plan to incorporate English antiques in your homes here is a bit about the different styles available. If you are looking for a quality antique oak cupboard here are a few tips to help you make the best buy. Over the centuries the wooden chest and trunks have been the most common and functional pieces of furniture found in every home. During the medieval times, the wealthy nobles would own a number of chests which served the purpose of both furniture and luggage. Over the years and with the intended use, the simple storage chests have evolved into various different styles depending on the uses. Antique buffets and sideboards make great additions to the home. 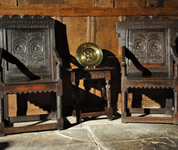 These traditionally used to sit next to the walls of the dining rooms and were primarily used for serving food. The cupboards under provide ample space for storage of cutlery and dishes. In the modern homes these can be put to versatile functional uses. Apart from being functional these are full of charm and character that look very elegant in the contemporary homes. Antique oak furniture apart from being very attractive and appealing is quite durable too thanks to the quality of the wood and its strength. The antique oak furniture items come mostly in darker tones which carry a formal air and there are also options available in warm honey color, shiny reddish, mellow brown tone etc. Coffers first came into being in the 17th and the early 18th century. Often also referred to as strongbox, money box, cash box, money chest, treasure chest, casket, trunk, box, safe, safety-deposit box, safe-deposit box or repository. These elegant pieces of furniture were commonly used in the olden days as storage pieces and now still make a handy storage accessory. 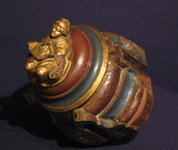 Many antique carvings are from the 15th century, some eralier and some later. They make great decorative pieces. The unique appearance and skilled craftsmanship that each of the items portray is often simply stunning. 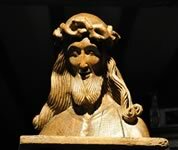 If you are planning to go for an antique carving or a sculpture and do not know where to start here is a quick guide to help you get started. When incorporated in the right manner, Antiques blend in very well and complement the look of your contemporary decor. Antique elements in the decor bring in a certain charm and character to your homes. Antique chairs are a favourite inclusion in the modern homes and achieve the same charm and character as the other furniture options. These bring in a sense of style and comfort to your homes. The variety you can find in terms of style, colours and designs is enormous. Antiques add charm, history and mystery to your decor. Invariably they also appreciate in value as opposed to a new piece of furniture. There are different kinds of antique furniture items that you can incorporate in your home to bring in the feel of the old world. Antique dressers are one such kind of furniture items that are packed with an aesthetic appeal and are at the same time functional. Country style furniture is all about a relaxed appeal that infuses a home with warmth and natural comfort. There is nothing overly elaborate about country style furniture. It is all about simple and minimalist designs since the true roots of the country style goes way back to simple rural living. Incorporated in the modern homes, these can bring in a fresh difference to the everyday design schemes. Gothic art and architecture has time and again been associated with the dark and mysterious by many. But Gothic style did the exact opposite and brought sunshine to the holy churches. The Gothic architecture, which has its roots in the Romanesque architectural style, developed primarily into the ecclesiastical architecture and was often seen in the churches, cathedrals and abbeys, castles, palaces as well as the town and guild halls, civic buildings etc of the time. This style flourished in the medieval period somewhere in the late 12th century and lived through to the 16th century. In terms of design, the gothic architecture has been characterized by pointed arches, ribbed vaulting, large windows and pinnacles, fantastic ornamentation and exquisite tracery. We hope you like our recently upgraded website. 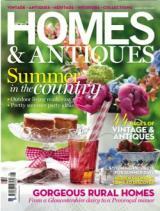 Whilst keeping our ever popular look and feel we have increased the size of images on the home page and of the items. With the increase in download speeds it is no longer necessary to have small images to facilitate a fast download. The Rairity of English pre-reformation sculpture cannot be over exaggerated. When the reformation of the churches cathedrals and sacred sites of England occurred in 1530 under the reign of Henry the V111 all devotional medieval works of art were destroyed by huge bonfires or smashed to smithereens in all towns and cities of England. At Period Oak Antiques we have managed to acquire some very elegant antique chests that are nothing but class apart. Antique chests are being repurposed in todays's homes in the most versatile of the ways these days. While some become coffee tables or the side tables, others are useful for their storage capacity as well as enhancing the decor in whatever room setting is chosen. We have some of the finest options that will be loved by the collectors and enthusiasts. 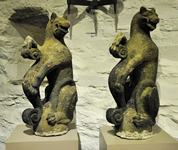 Originally believed to have belonged to the Sackville family these leopards represent the Sackville coat of arms. 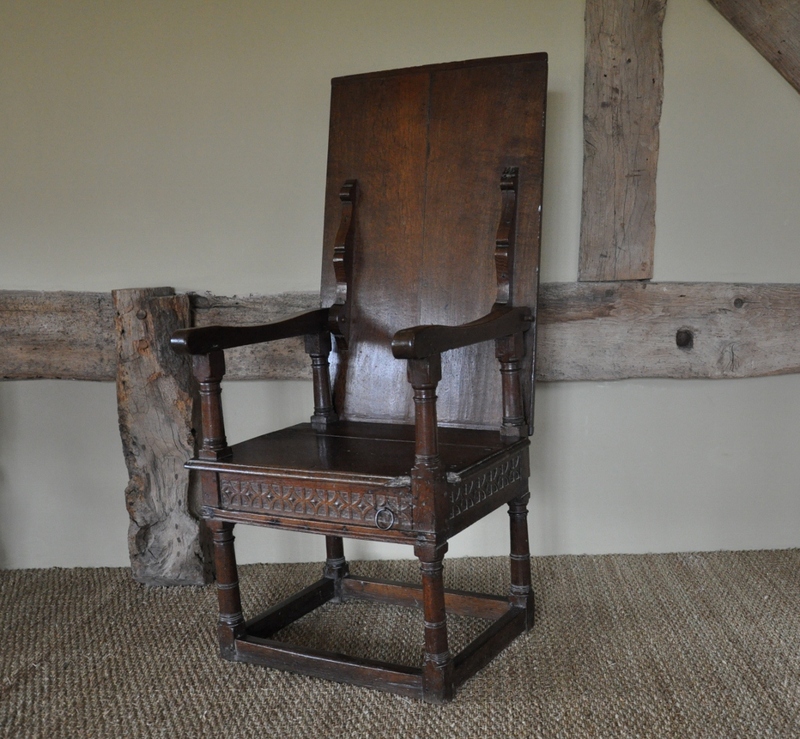 The Wainscot chair (also commonly known as the panel or joined chair) usually was made out of the finest grade of oak. These chairs are typically characterized by flat wooden seats with molded edges, a beautifully carved seat rail and legs joined by low straight stretchers. The wainscot chairs usually come with shaped front legs and square sectioned back legs. Check out this fabulous Charles II livery cupboard that we have just acquired. This beautiful cupboard with a central heavy moulded drawer and a potboard base with scalloped frieze is in excellent condition and a warm colour. Perfect for the classic or the contemporary decor. Four poster beds, though the prized possessions of the past have had a dwindling existence in the interiors today. This is perhaps because of the shrinking size of the contemporary bedrooms and that no longer is the bedroom a place of public presence where a grand bed seen by many was an essential tool for displaying ones wealth. The four poster bed was the king of all beds due to its inposing size and often ornate design. 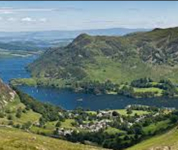 We moved from our wonderful location in Presteigne to an equally beautiful location here in the Lake District. Our stock of beautiful antique furniture and other stunning decorative antiques though remains as good and interesting as ever and our showroom offers even more benefits to the visitor than before. With Christmas just around the corner again. Here are some suggestions for the late shoppers! Valuing antiques is not easy. But there are again quite a few pointers that will help you to ascertain a rough value of the antique. We have already seen some guidance for identifying whether an antique is original or fake. Once it is ascertained whether the item is a mere reproduction or an original classic you can then proceed with the valuation process. For centuries the antique oak fourposter bed has been the prized possession in many a great household throughout the land, from castles to manor houses, farmhouses and cottages alike. these great beds have always been the focal point of a period bed chamber, even to this day they are still in great demand, they look equally at home in a modern setting as in a period home. Gothic architecture has been an important influence ever since its beginning. The Gothic period was characterized by beautiful things and Gothic architecture was often considered the most important feature of the period. The Gothic architecture had its roots in the Romanesque art and started taking shape somewhere in the late 12th century to the early 13th century. The Gothic period is roughly classified into the early, high and the late Gothic periods and extends right up to the 16th century. 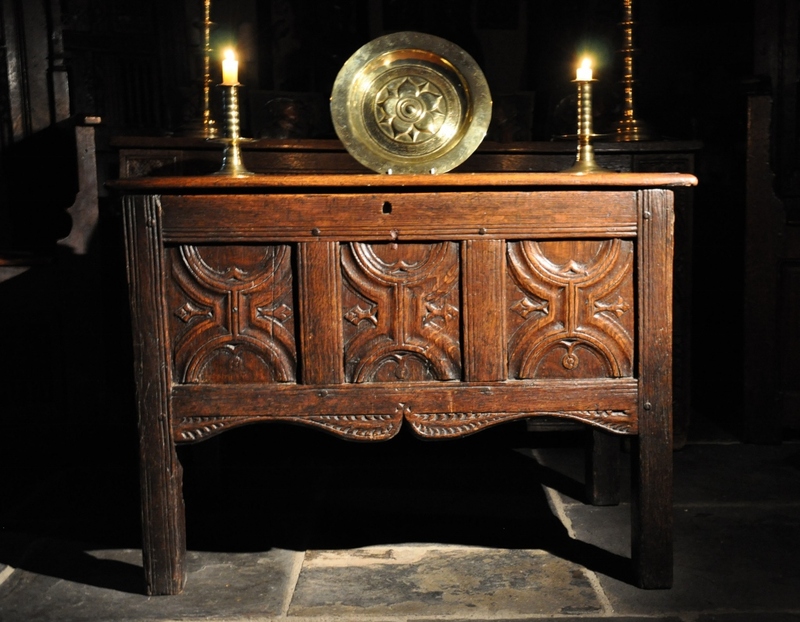 We are proud to have in stock a truly outstanding antique carved oak chest, with an impeccable regal history. This imposing ‘great chest’ was made in northern France towards the end of the 15th century and has intricate carving on the front. It is in wonderful condition, thanks to standing in a royal palace for hundreds of years, until Queen Juliana of the Netherlands gave it to a baroness from one of the country’s oldest families. 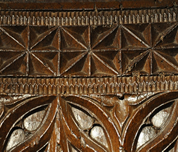 Wooden ceiling bosses were a common feature seen in the cathedrals and church during the early times, predominantly the 13th and the 14th century. These ornamental objects were an important part of the Gothic Architecture and were a common feature in most of the Gothic churches. The ceiling bosses were beautifully created to be decorative as well as functional. Stools are the seating options that come without arms or the back rest and are usually suitable for one person. 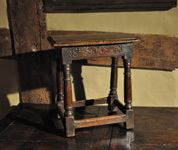 Joint Stools were one of the most common form of sitting in the early times. These were made in bulk quantities during the 16th and the 17th century. The joint stools were one of the most versatile pieces of furniture and were used for a variety of different purposes. 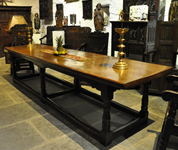 Over the centuries the table has allways been the centre of the household, literally used for everything whether to celebrate special occasions such as christmas, births, marriages and feasts for all occasions. The table has allways been the platform for the family gathering. Seeing the notice of the upcoming Interiors UK 2014 exhibition of brand new oak furniture at Birmingham, I wondered why people would spend money on new furniture and see their purchase depreciate dramatically over a period when they could so easily invest in an antique table instead? If they go for antiques (which will come for about the same price) it would in fact gain further in value instead of depreciate. Well more often than not it usually does! Unfortunately there are the occasional fake antiques on the market which are not as easy to spot. When buying antique oak furniture and other period antiques you need to be very careful to acquire the genuine articles and not fall foul to a fake antique. Even though it is no easy task to spot fake antiques, there are a few pointers that might help you in identifying the real antiques from the fake. Rosanna Morris explores the byways and backwaters of rural Britain to track down inspirational antiques and interiors shops worth going the extra mile for. 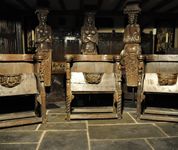 These remarkable chairs are freestanding which is very unusual as they are normally found conjoined in rows within an area devoted to the church choir. The back moulded legs are splayed outward and joined by a pinned stretcher as are the front ones. 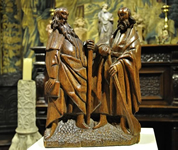 the deeply carved imagery on all three chairs consists of a central carved misericord seat flanked on each armrest by unusually prominent carved figures, each figure with its own medieval meaning. There is no real evidence of them ever being conjoined, but if they where it was possibly at a stage very early in their construction.